UIU Associate Professor of Art Elissa Wenthe (left) provides Jane (Wilwert) Tucker of Sumner with a short demonstration during the University’s recent community education program in Fayette. Tucker, a 1974 UIU alumna, was among the local residents to participate in the ceramics course held in the UIU Performing Arts & Athletic Center. Start with a spacious, highly functional facility. Add in advanced art equipment. Pour in people of the community. Stir in a little ingenuity. Mix well and soon admire remarkable creations of ceramic art. 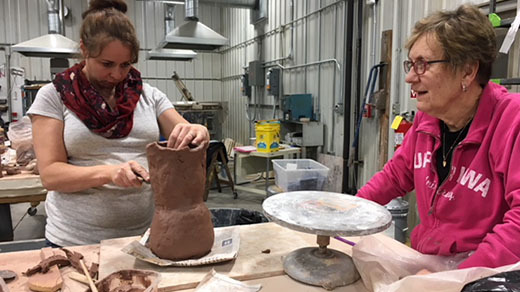 For five creative weeks, a dozen local residents met on Tuesday evenings at Upper Iowa University’s (UIU) Performing Arts & Athletic Center (PAAC) to create handmade ceramic pieces. As part of the community education program hosted by UIU Associate Professor of Art Elissa Wenthe, the participating adult learners shared the PAAC art studio space with the University’s art students. A strong believer in lifelong learning, Wenthe took advantage of her program’s recent relocation to the more spacious PAAC to offer her first community education art class. She envisioned the program’s popularity and it didn’t take long for the community to prove her instinct correct. Enrollment for the inaugural class was filled merely six hours after advertising it across social media, with residents from Fayette, Elgin and Sumner among those in attendance. The students ranged from recent UIU graduates to area retirees. As part of the community education program, adult learners are able to interact and grow artistically with each other. Wenthe stressed that the classes focus around having fun while developing basic skills in art. Each class starts off with a basic outline and demonstration, showcasing the art skills they will be incorporating during the course. Activities, such as making vessels and forms with ceramics, are some of the things the most recent class experienced. However, Wenthe enjoys hosting a flexible and constructive class room and if students have another interest they are able to pursue that art form as well. UIU art education students were incorporated into the community education class as instructors. With continued success, Wenthe aims to schedule one community education class per academic session. Registration times have yet to be set, as logistical details are still being determined. Wenthe also hopes other UIU departments can develop community education programs of their own. The newly leased PAAC facility has created an exciting space for two- and three-dimensional art, and the UIU baseball, softball and golf teams have taken up residency in the 30,000-sq.-ft. building. The university continues to raise funds for PAAC upgrades. Persons wishing to further support the Peacock baseball, softball, golf and art programs, should visit https://uiu.edu/alumni/paac.html.